Huge Odd Bird Planet Spring Sale!! There's a sale going on over at Odd Bird Planet and you don't want to miss out! Oodles of stamps are on sale for 30% off and can be ordered mounted or unmounted. 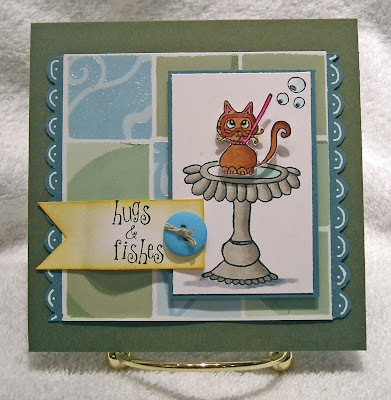 Ms. Priscilla, used on my card and sporting her scuba gear (and apparently fancying herself a fish) is part of the sale. All of the sale image names and item numbers are listed below. To find them in the online store simply type the name or item number into the search tool. The sale ends on April 8th! Time for Those SNE Class Projects! Finally! 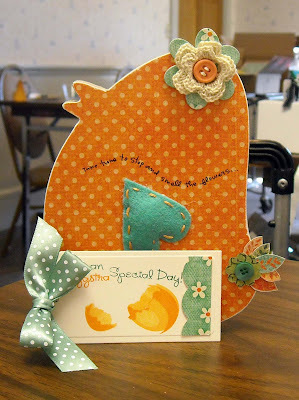 I'm getting around to posting the photos of our amazing projects that we created during the Stamping NE event! Some of you may have already seen these projects on the instructors blogs so I apologize if it's a repeat but I really wanted to highlight the beautiful work offered to us during our event last weekend. The one image I'm missing is from our Friday evening project, taught by Karen Motz, who is far too fantastic. :-) And I just have to say that I was totally digging her Canadian accent! hee hee We created an adorable album for holding sketches. Karen also demonstrated how to use a Bind-it-All, which I had never used. I'm trying to to run out an buy one...they are very fun and I can envision using one for all sorts of fun projects! Please, please, please hop over to Karen's blog to see photos of the album. It's so cute!! On Saturday morning our first project was taught by Lauren Meader. Many of you know Lauren and this was my first chance to meet her in person. She is just adorable and so sweet! 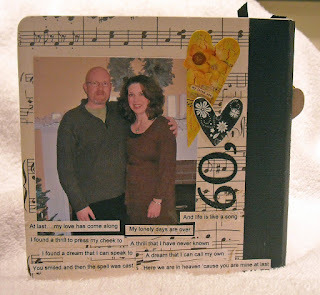 She brought with her one of her unreleased templates, sold through Papertreyink. We then used our FREE PTI stamp set to decorate the box. This was my first time using one of Lauren's templates and it was super easy and too cute! We then filled our boxes with lots and lots of chocolate! Yummy! Next, it was time for Cindy Lawrence and watercoloring. 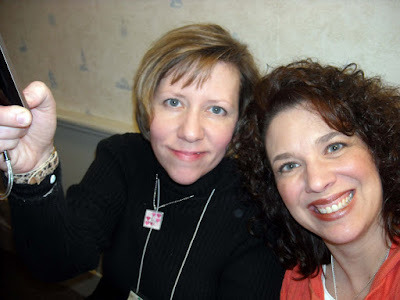 I never met Cindy so I didn't know that she is not only a Stampin' Up! demonstrator but that she has a huge downline! (Yes, Cindy it's huge! LOL!) I know I'll say this about all of the instructors but she was so nice and I had a great time getting to know her. 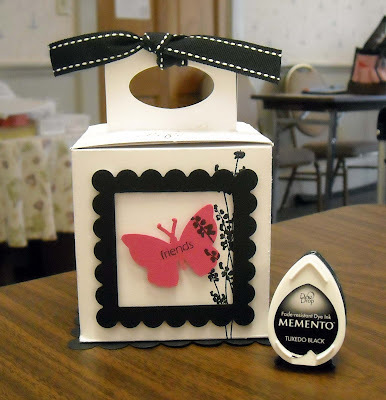 She presented us with a beautiful project, complete with two cards, stamped envelopes, and a clear box to hold the cards in. I was so impressed by her watercoloring abilities and it was nice to learn more about the technique. And the cards are stunning! Loved this project! We broke for lunch and then it was time for Julie's class. I was super excited about her class as we were going to get a chance to play with some of Deb's oh-so-cute die cuts from Say It With Letters. This darling chick was designed by Julie, isn't is adorable!! I love the stitched wing and the little crocheted flower on it's head! Julie crocheted all of the flowers for the class! 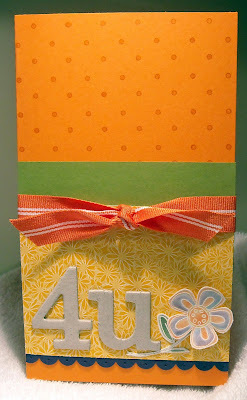 I also was thrilled to get to play with the Kitchen Sink stamps to create the adorable tag. I need some practice with the three step stamping as I didn't line up my last layer very well! LOL! This was a really fun project and my chick is already on display in my craft room! Our last class of the day was taught by the fabulous Joanne Basile! I again was excited to play with stamps that I have never used. 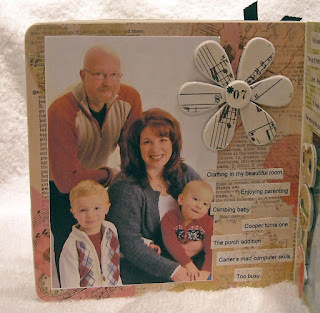 Joanne showed off her amazing paper piecing abilities with the My Favorite Things stamps. There are some serious layers on these cards...they may weight about a pound each! And they are just amazing, not just in the design but also in all of the details. These cards are also proudly on display, along with all my other SNE goodies, on a shelf in my craft room. 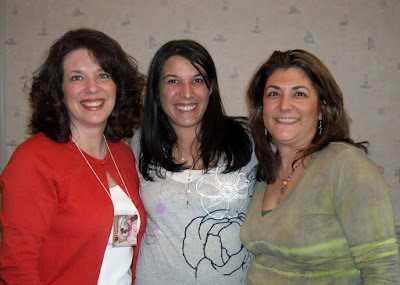 I am so grateful that I was able to be a part of this stamping weekend and got to meet so many familiar stampers! The stamping industry is one of the warmest and it was a delight to spend a few days with these talented ladies!! But it's for a good reason!! Look at my new blog design!! WooHoo!! Not that I've been the one busy working on it...I've just been busy proofing and making changes to the design elements. It's been Sara Williams over at Tweaks and Designs and she did an absolutely amazing job with my new design! When she sent over the first proof I was shocked at how pretty it was and how she was able to create something amazing from my vague design ideas. Thank you so much Sara for creating such an amazing blog design - I LOVE it!! And I promise to be back with more pictures from Stamp NE and projects very, very soon! (Oh, and some very exciting news too!!) I've been a busy girl this week... :-) Enjoy! The prize table...and this is only about 3/4 of the gifts! We had over 50 prizes for our attendees! Many, many thanks to all of our super generous sponsors!! (You can check out the list on the Stamp NE blog) We love you guys!! 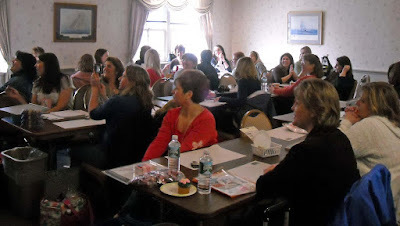 Our full class on Saturday morning...notice how everyone is paying very close attention to what Lauren is saying...She's just about to reveal that Papertreyink gave EVERYONE in the class a FREE stamp set! The class went wild when they heard the news! These fabulous girls, Jodi and Ann, are both from Long Island! They made the drive up from to NH for our event and we couldn't have been happier! Being from Long Island, I was super excited to meet them and they are both about as hysterical as people can be...Far too much fun! 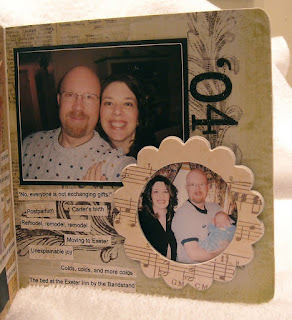 They're both also amazing card makers...check out their blogs! 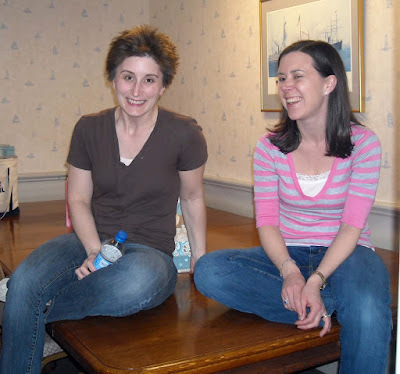 This is at the end of our event and I think it's such a cute picture of Molly and Joanne... just had to share! Poor Molly was just getting over pneumonia...what a trooper to make it out to the event! And Joanne taught a fantastic class as well as did a tremendous amount of work planning the event! I've said it before but it bears repeating...we had a blast! LOL! We're already working on planning our next event, just trying to determine where it will be. Feel free to drop me a note if you'd like to see a Stamping Around event hosted in your city... :-) Tomorrow, I'll share our beautiful projects we created in our classes!! I'm Back and I'm Exhuasted!!! Yes, I've been back from the Stamp NE event for a little over 24 hours...and I'm still tired! LOL! We had an absolutely amazing, fun, fantastic, exciting time! It was so nice to meet people in person that I've either met online or have known of through their blogs. The instructors did a wonderful job with their projects!! They demonstrated techniques, we created cards and 3-D items, and the giveaways - holy moly - the giveaways were unbelieveable! We are so thankful to all of our sponsors for their generosity...it was really overwhelming! Enjoy and I'll be back tomorrow with more news...Oh yeah, the Copic Certification class was wonderful too! I'll share more about the class and techniques in the next few days/weeks as well. vs. 1-3 "God is our refuge and strength, a very present help in trouble. Though its waters roar and be troubled, Though the mountains shake with its swelling." vs. 6 "The nations raged, the kingdoms were moved; He uttered His voice, the earth melted." I'm headed to CT tomorrow to attend a Copic Certification class and I'm far too excited! I've been waiting for months for a class to come close enough for me to attend. Can't wait to learn how to really use my most beloved markers. After my class I'll share these same cards after color has been added. And you know what I love about Odd Bird Planet stamps? How you can create little scenes with the stamps. How fun is that? Check out Emilia's site for cards that are simply amazing...She has a real talent for creating amazing scenes with the OBP images. (Heck, the entire design team is simply amazing!) Be sure to check out the wonderful St. Patrick's Day cards most of them posted yesterday! Links to the designer's blogs are on the right hand side. Well I'm off to play with my little ones...who are starting to get restless! Enjoy your day! Lots, lots, lots to share this evening! I've got a sketch challenge to share, news on a special SALT posting, and finally some sad news. I first want to highlight the special SALT challenge post from yesterday. Working with Anne over at A Faith Perspective and SNR, we've put together a sponsored post on friendship with Anne giving away a free three month subscription to Scrapbook News & Reviews online magazine! Please head over to the SALT blog to read the write up and leave a comment so you will be entered into the drawing for the subscription. And also be sure to check out our amazing new designers that were just recently added to the team! I'll do a separate post to highlight their blogs but in the meantime journey on over to the SALT site to check out their work! 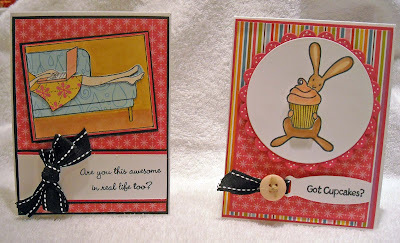 Next, I decided to incorporate Taylor's Friday cupcake sketch challenge with my SALT challenge card! Adore the sketch, isn't it fun?? 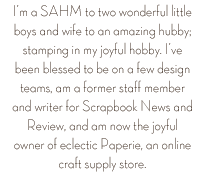 My card is sporting all Stampin' Up! products and images. 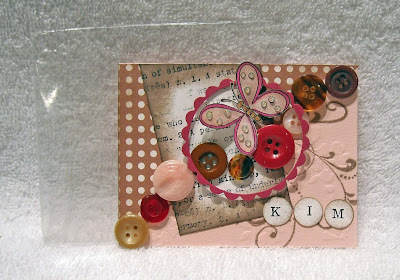 Since this card was oh so easy to create I think it would easily fit under my Keep it Simple Sunday post as well! And lastly, the reason I'm running behind on my SALT post, is the sad news. Friday evening we had to put down our 13-year old cocker spaniel, Max. He developed some troubling symptoms early in the week and by Friday collapsed. It was heart breaking as he'd been such a healthy dog. For 13 years he had only one minor issue involving a bit of surgery to remove a benign tumor. He was never sick, never had an ear problem (a miracle for a cocker), never chewed up anything other than dog toys, was house broken in one week (I kid you not! ), was as friendly as could be, and adored our children even though he'd been the only baby in the house for nine years. So..it was very sad to see him so sick and struggling so much. He was definitely starting to show his age over the past few months but I guess I thought we'd have him for a little longer. We're thankful for the time we had with him and fondly remember all of his silly ways. Here he is snuggled under a blanket...one of his favorite places to be! Hope you enjoyed tonight's triple play!! 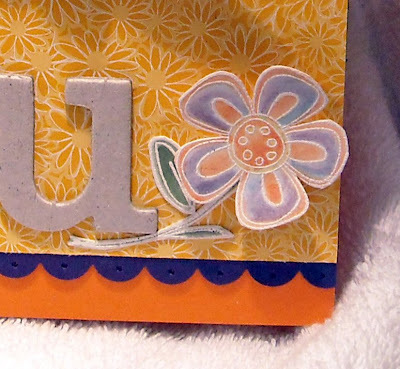 :-) Be sure to check back in during the week as I'll have another SALT challenge and will share more of the chipboard projects I created in my video post. Someone please tell me it isn't Friday already...It can't possibly be Friday...I have far too much work left to do for the week to be over! And I can't believe I haven't posted since Tuesday...Did I enter some sort of time warp? LOL! Really, I am constantly surprised at how quickly time passes once one has children! I don't recall my days spent in an office going as fast! 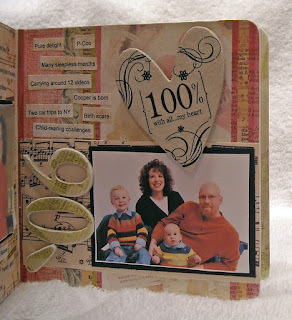 OK, enough complaining about the passing of time and onto today's scrapbook page! 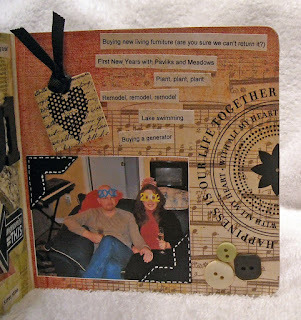 This is a layout using another one of those handy dandy pieces of chipboard I shared in the videos last week. 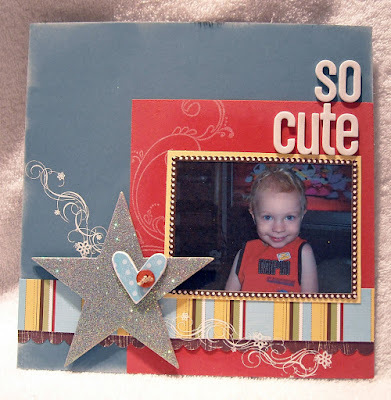 The star is covered in a very fine glitter that was adhered using heat and stick powder from Stampin' Up! Have you ever used that stuff? It's fabulous! You use a Versamark pad to get the heat and stick to well...stick, just like embossing powder. Upon heating the powder it melts and becomes a crazy sticking glue substance! Turn off the heat gun and dump on the glitter! Cool product, this was the first time I used it... I found this picture of our oldest - this was taken about three years ago - when cleaning up my craft room. This is one of my favorite pictures of our little munchkin. He had a hard time when number two child arrived (he was barely two) and went from being a sweet, loving child to a hard to handle wild child! (He's much better now...thank you God!) But he looks so adorable and innocent in this shot...no one but his parents would know what trials we were going through with him! 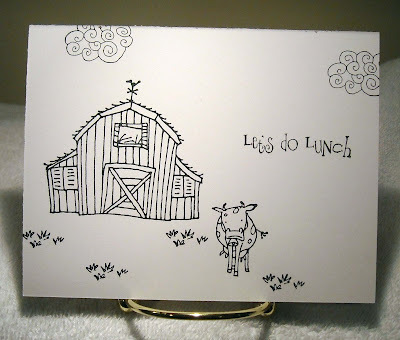 hee hee All of the supplies used on my page are from Stampin' Up! with the exception of the letters, which are from American Crafts. Enjoy and stay tuned for a special SALT post tomorrow...Oh, and did you check out the new SALT design team? Get on over to the blog and check out the links!! Greetings all!! I pray that everyone has had a blessed Sunday! We've enjoyed warmer weather here in the Northeast today, actually went out without a coat on, and had a wonderful day at church. Everyone remember to set their clocks ahead an hour? Yeah....we remembered but our alarm clocks, named our two children who are usually wide awake at the crack of dawn, failed us and we overslept by an hour! So much for Sunday School today! LOL! Well I have a simple project to share today that is even easier than remembering to change all the clocks in your house! 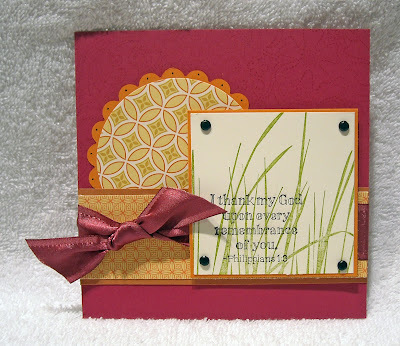 Today's two cards were made using a Stampin' Up! Simply Sent Card Kit. These wonderful kits were introduced by SU! a few years ago and I purchased one back when they first appeared in the catalog but had never actually opened the kit until last week. These kits are just amazing! (I've pictured the complete kit above) Each box comes complete with a stamp set or stamps, pre-cut cardstock, ink and or markers, ribbon, even adhesive! 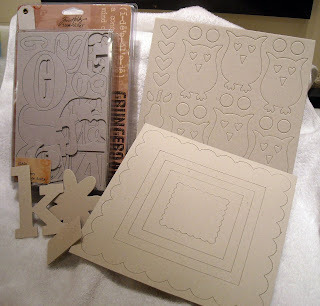 Every piece of cardstock is cut for you...each layer...and there is even an instruction book included! All you need to do is put the pieces together. The kits come with enough supplies to create 10 cards. You can see the available kits at the links below and if you love them, you can order directly from my site: It's All About You Card Kit 2U Simply Sent Card Kit Thanks X2 Simply Sent Card Kit When making my cards, I did very little to alter the way they were designed in the kits. 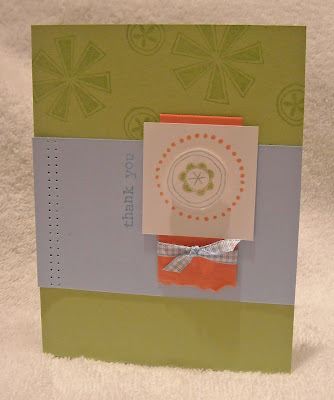 For the "thank you" card below I did create a different background on the green cardstock, although still using the stamps that came in the kit. I also added two rows of paper piercing...that big blue expanse of paper just seems a bit too plain. :-) Other than those two changes, this card is exactly as described in the directions. 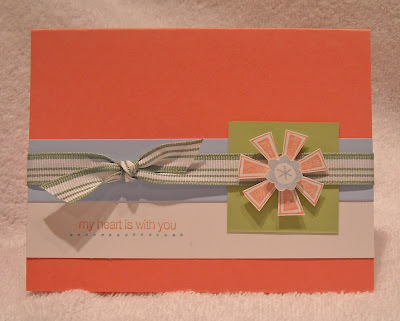 And isn't it great that all those pieces of cardstock used on the card were already cut...just love that!! The "my heart is with you" card also stayed virtually unchanged. 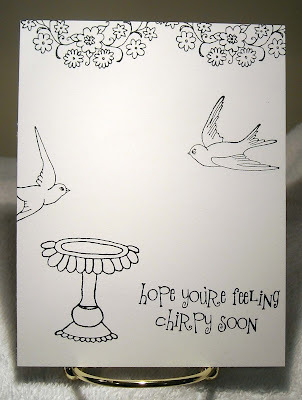 I did use a different sentiment, as I wanted this to be more of a "thinking of you" card vs. a "thank you" card. I also changed the ribbon as I felt the grosgrain ribbon they included was a bit too narrow for the blue cardstock. I like beefy ribbon! 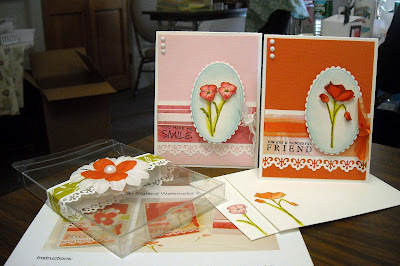 :-) Also really love the colors in these cards, the cameo coral adds such a nice pop to the muted blue and greens. 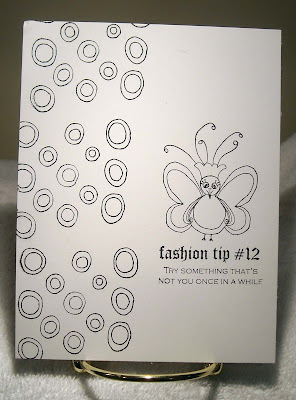 These cards took mere minutes to create since the cardstock was already cut for me but even if I had to cut my own cardstock these are still very simple cards that could be easily recreated for any occasion! Enjoy! PS - Forgive the weirdness of my blog...I'm having some spacing issues this week, will try to get it fixed. Am hoping to be ready to unveil a brand new design in the coming weeks...Stay tuned...And don't forget to check in at the SNR site for their two week Spring Fling Event!! Scrapbook News & Review - Spring Fling Event!! Wow, wow, wow!! Welcome to the SNR Spring Fling event! I'm honored to be working with Anne over at the newly launched SNR social networking site (also home to the SNR magazine)to kick off their huge two week event that will be filled with tutorials, projects, techniques, and prizes! Be sure to check back in at the SNR site over the next two weeks to see what else they have in store. Also browse through their online videos, forum, and gallery of beautiful creations! Today, I'll be demonstrating a number of ways to alter bare chipboard. Chipboard comes in such a wide variety of styles, shapes, letters, frames, and numbers...the design possibilities are endless! 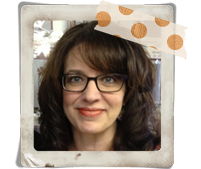 In my demonstration I'll be using Stampin' Up! 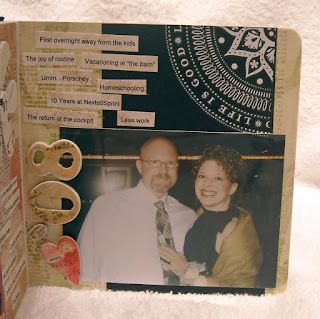 chipboard and Tim Holtz Grungeboard. I've created a total of five videos, demonstrating four techniques. Yes, this is my first shot at creating a video...(No hysterical laughing at my beginner videos, which is what my husband and I were doing the entire time...One day I'll share the bloopers!) Even though there are five videos, the total time required to watch all of the videos is only about five minutes. 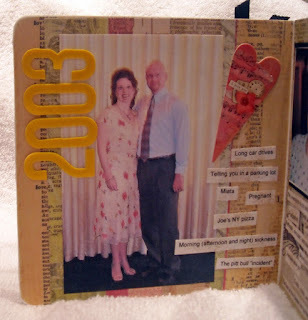 At the end of the videos I've posted a project, a mini album created to celebrate my 10-year wedding anniversary, using a number of the chipboard options from the videos. 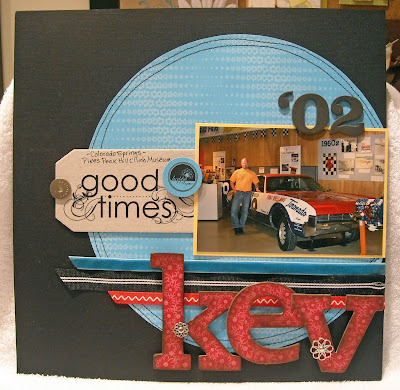 Here we go...The first two videos demonstrate one of the most popular ways to alter chipboard, using patterned paper. This next video demonstrates a very quick and simple technique; adding color with an ink pad and sponge along with a stamped image. 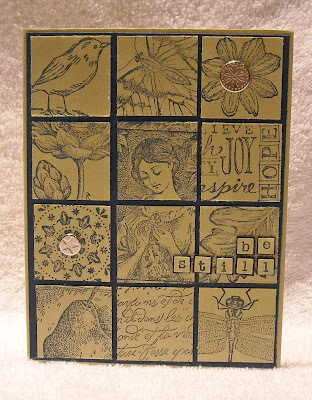 Now we move onto my last video, which is showing three other options for covering chipboard, using embossing power, glassy glaze, and glitter. That's it for the videos...Now for my project!! Our wedding anniversary is on January 9th...just a few weeks after Christmas so there's typically a lack of funds in our household come early January. 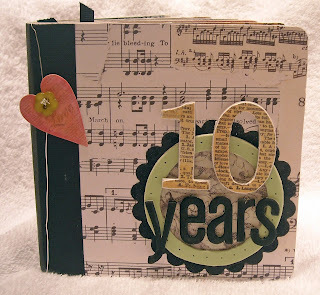 :-) That being the case again this year I wondered what I could do for my husband to celebrate our 10th anniversary. I decided to create a mini album for him to have on his desk. 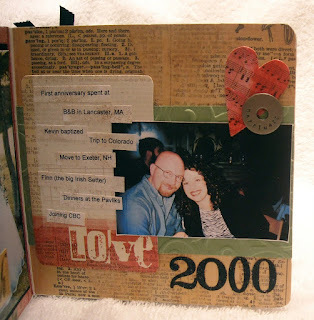 Each page of the album included a picture from each year we've been married along with a few lines of text on the highlights from that particular year. 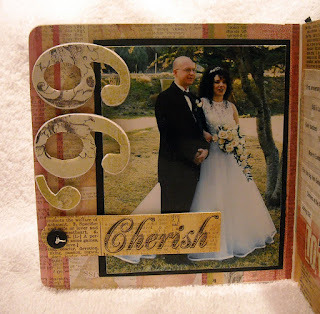 I've used chipboard on almost every page (hey, the album was made out of chipboard!! 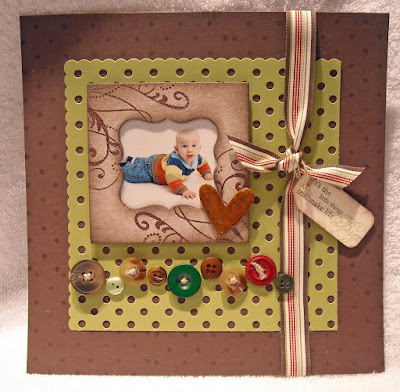 ), mostly covering the chipboard with patterned paper and using rubons. The good news it that my husband was so happy with the album...he was teary (you know you've done a good job when they get teary!). One day I'll share the hysterics of trying to create this in secret with him sitting next door. It made for some comical moments! Please click on any of the pictures to enlarge them. Thanks for hanging in there with today's long post. I had a wonderful time creating the videos for SNR. 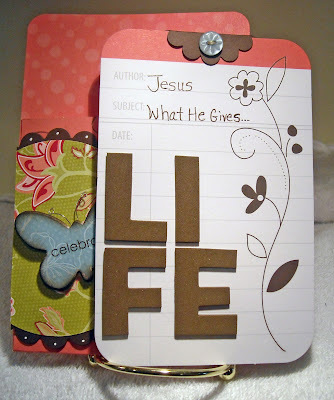 Be sure to head on over to see all the fantastic things going on at their site..Anne has set up an amazing faith-based site and magazine for scrapbookers and card-makers who have a desire to integrate their creativity and faith at A Faith Perspective. One of the amazing changes that happens when one trusts in Christ, by repenting of their sins and placing their trust for eternity at the feet of Jesus, is that they are changed....really transformed. Those who were once driven by selfish motives are selfish no more, those who were habitual liars are liars no more, those who were cheaters are cheaters no more. And for many the change is overnight. This change, seen in the lives of so many that profess Christ, is so dramatic that it serves as a proof of God's existence and His power. Not only have I experienced this power in my own live but I have seen it first hand in the lives of others. No doubt people can create a certain level of change in their lives and maybe even gain some control over certain behaviors (although I would suggest that any positive change is attributed to God). However, it's pretty rare that these changes occur overnight and even rarer that they are long lasting or void of pride for one's accomplishments. Rather, real, deep, life altering, and lasting change can only be found in Christ. In our natural state, we are all weak and suffer from so many issues of pride, stubbornness, selfishness...The good news is that Christ came to break through those barriers to true happiness by giving us a way to get rid of that nasty burden of sin that causes us to stumble through life. We may seek many ways to be rid of the burden but it will only roll away at the foot of the cross of Christ. May God be praised for His great goodness! This creation is based upon a similar card I made for the SALT "Rest" challenge. 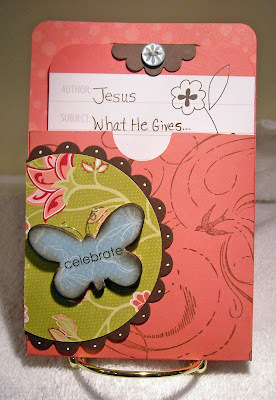 I liked keeping with this cohesive idea of "what Jesus gives." In the first sample, here, He gave rest and in this sample He gives life. I think I may start a collection of these cards...based on what our fabulous SALT team comes up with for challenges! 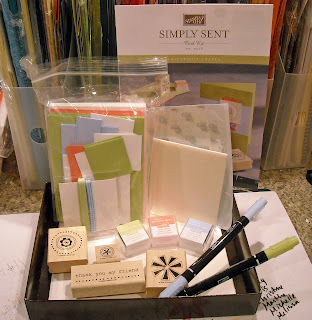 :-) All supplies, with the exception of the pocket card, are from Stampin' Up! Stop by the SALT blog to see the other team creations! And please leave us with a comment and link back to your blog or gallery if you create something based on this week's theme! 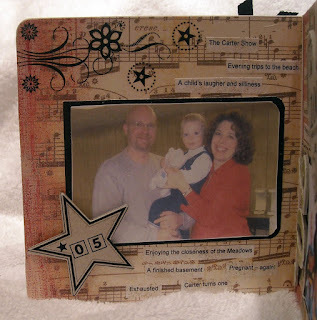 All of the products used to make my KISS card are from Stampin' Up! and I hope my SIL likes it! She should be happy that she's finally receiveing her Christmas present just in time for St. Patty's Day! LOL!